Music is a unique way of communicating that can inspire and motivate children. It is a vehicle for personal expression, and it can play an important part in the personal development of individuals and groups of people. Music reflects culture and society, and so the teaching and learning of music enables children to better understand the world they live in. Besides being a creative and enjoyable activity, music can also be a highly academic and demanding subject. It also plays an important part in helping children feel part of a community. This vision of music is what our curriculum at Hillside is built around. We provide opportunities for all children to create, play, perform and enjoy music, to develop the skills, to appreciate a wide variety of musical genres, and to begin to make judgements about the quality of music. develop the interrelated skills of performing, composing and appraising music. Please click below to see our long term plan. We teach music in nursery and reception as an integral part of the topic work covered during the year and we also teach music in dedicated lessons that are aimed at giving our foundation stage children a taste of the interrelated skills that they will explore as they progress through the school. As the Nursery and Reception classes are part of the Early Years Foundation Stage of the National Curriculum, we relate the musical aspects of the children’s work to the objectives set out in the Early Learning Goals (ELGs) which underpin the curriculum planning for children aged three to five. Music contributes to a child’s personal and social development. Counting songs and rhythms foster a child’s mathematical ability, and songs from different cultures increase a child’s knowledge and understanding of the world. At Hillside we make music an enjoyable learning experience. We encourage children to participate in a variety of musical experiences through which we aim to build up the confidence of all children. Singing lies at the heart of good music teaching. Our teaching focuses on developing the children’s ability to sing in tune and with other people. Through singing songs, children learn about the structure and organisation of music. We teach them to listen to and appreciate different forms of music. As children get older, we expect them to maintain their concentration for longer, and to listen to more extended pieces of music. Children develop descriptive skills in music lessons when learning about how music can represent feelings and emotions. We teach children to make music together, to understand musical notation, and to compose pieces. Our music lessons aim towards teaching the children to be able to perform and compose and appraise as part of an ensemble. We believe that music enriches the lives of people, and so we wish to involve as many children as possible in musical activities. 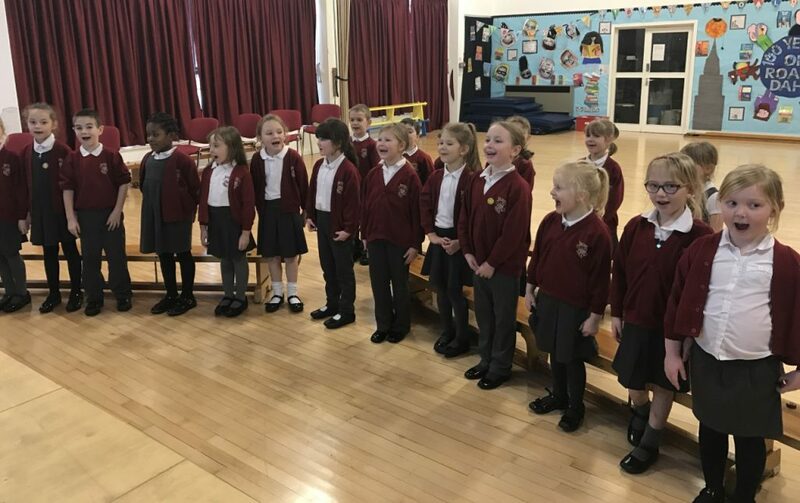 We have Singing Stars for Y1-Y3 where children learn to sing and perform through a variety of songs and games and the Singing Stars take part in two large inter-school concerts each year that take place at a professional theatre. The school choir, which we encourage all children from Y3-Y6 to join, also takes part in inter-school concerts and sings at all Church and school celebration events. The school has a dedicated Rock Band whose members change each year. The Rock Band meets every week and takes part in the Choir and Singing Star concerts as well as three inter-school Rock/Pop themed Concerts. 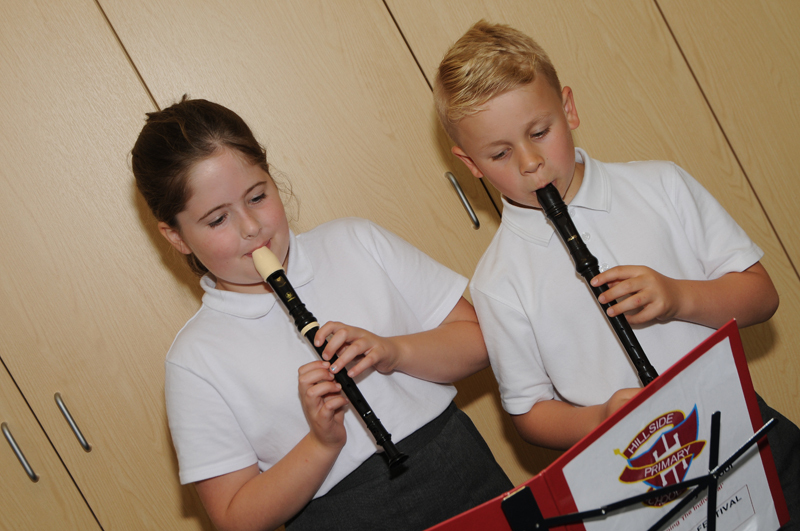 The school Recorder Club is always growing and is invited to take part concerts and celebrations throughout the year. Music possesses several unique and extremely valuable educational characteristics that are particularly important in today’s schools, which face increasing pressure to provide students with an education equal to the challenges of the twenty-first century. Music positively impacts reading, language, math and logic skills and is universal in application, leading to excellent learning opportunities across the curriculum. Additionally, we must instil in students the ability to navigate our increasingly multicultural, complex and integrated world. Music, as the universal language, clearly has the capacity to reach across cultural boundaries like no other activity. Another area that must be considered a core aspect of an education worthy to meet the demands of the twenty-first century is creativity. The ability to think outside the box to address increasingly complex issues and challenges and to make new and different connections that lead to exciting discoveries and knowledge will be one of, if not the most important characteristic that students must possess to be successful in a globalised world. Music is our most effective educational tool to encourage and develop creativity. English – Music encourages children to listen carefully for specific purposes and to articulate responses. Singing songs develops children’s language skills by focusing attention to rhythm, rhyme, diction and meaning. By working with others in a musical setting, children develop their ability to communicate ideas effectively. Mathematics – by studying the structure of music, children are observing patterns and processes. Rhythm in music has a mathematical basis, and counting and recording beats in a piece of music reveals mathematical structures. ICT – older pupils can use programmes such as ‘Recorder’ and ‘Videostar’ to compose music, and make music videos. PSHE and Citizenship – by making music in groups, children learn to work effectively with others and they learn the importance of good working relationships. Making and performing music builds self confidence and often allows pupils who are not academically gifted to shine. Working together on a performance can be one of the most memorable things a child does in his or her time at school. Also, music gives children a vehicle for exploring feelings in a unique and safe way. Spiritual, moral, social and cultural development – listening to, creating or performing music can sometimes be a moving or even spiritual experience. Singing in church at Easter and Christmas are both examples of this. By studying the music of other cultures, children can develop more positive attitudes towards other cultures and societies that may be very different to their own. MFL – one of the best ways to teach a foreign language is to learn songs in the language, as children remember vocabulary more readily when they have learned a song using the vocabulary. The school is stocked with a variety of instruments including classroom percussion, un-tuned and tuned classroom instruments, recorders, keyboards, drum kit, a class compliment of acoustic guitars and ukuleles as well as a large set of djembe. We also have a full rock band set up including microphones and electric guitars. The Hall is equipped with a high quality sound system and lighting rig which enhances the musical experience for all who take part in school celebrations. Children demonstrate their ability in music in a variety of different ways. We assess children’s work in music by making informal judgements as we observe them during lessons. On completion of a piece of work, the teacher assesses the work and gives oral or written feedback as necessary to inform future progress. Older pupils are encouraged to make judgements about how they can improve their own work. At the end of a unit of work, the teacher makes a summary judgement about the work of each pupil in relation to the National Curriculum, and records these grades. We also record our musical work on photo and video and this is used to show the children their skills and to inform future teaching and learning.